Triple Paralympic gold medallist Michael McKillop eased to victory in Friday's T37-38 800m heats at the IPC Athletics World Championships. The defending champion from Glengormley pulled clear in the home straight in Doha to clock 2:07.18. "It was tough but I'm glad to be here and it's going to be a great final," said the 25-year-old. Ireland team-mate Jason Smyth is through to the T13 100m final after winning his heat in 10.79 seconds. The Paralympic champion was reinstated as a T13 athlete this week after being reclassified as T12 in 2014. 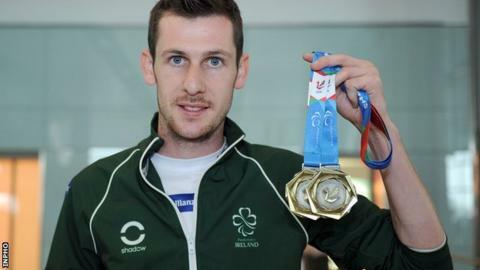 Smyth won T13 100m and 200m gold at both the Beijing and London Paralympics. However, the T13 category will only have a 100m in Rio, with T12 having both sprints. Can the Weirwolf catch the Silver Bullet? McKillop, who has a mild form of cerebral palsy, has not been beaten in paralympic competition since taking a World 1500m silver medal in 2006. He admitted after Friday's win that he was still not at his best after suffering a a foot injury earlier this year. "I'm not 100% in my head but in my heart I am and that's all that matters," added McKillop. McKillop will also defend his T37 1500m title in Doha in the straight final on Friday, 30 October.